A controversy brews over the merits of breeding plants that glow like a lightning bug. Proponents say glowing trees could eventually replace electric street lights, thereby reducing pollution created by generating stations. Opponents say messing around with tree genes is dangerous and should be disallowed since it could lead to unanticipated environmental ramifications on both plant and animal species. The unique aspect of this effort is that it is being pursued primarily by genetic hobbyists rather than corporations - at least for now. There is bound to be a huge financial potential for such a copyrighted line of plants. 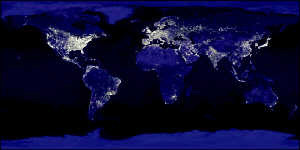 My opposition to the concept is primarily a concern for light pollution projected skyward. Astronomers have a difficult enough time with ever-encroaching sources of ambient light, but a planet overrun by cross-bred and mutated glowing plants (and possibly animals), especially if they are capable of emitting levels high enough to replace street lights, would effectively blind billions of dollars of investments in telescopes. You have probably seen the images of light levels from across the face of the Earth, with the greatest levels emanating from the world's population centers. A century ago universities were able to construct telescopes at the back of their campuses, away from main operational areas. Nowadays, even with expensive optical filters that block spectral lines from manmade terrestrial sources like high and low pressure sodium lights, halogen lights, mercury vapor lights, etc., there is still far too much background illumination to see dim objects. Most stars and nebulas emit in the same wavelengths as our artificial lighting, so filtering street light filters star light as well. Thanks to a massive effort on the part of astronomers - both professional and amateur - laws have been passed limiting the amount of light that can be released skyward by outdoor lighting. Baffles are installed around the perimeter as necessary to reduce skyward light emission. Still, light levels are overwhelming and increasing. A good night in my backyard with a clear sky, no moon, and low humidity allows me to see stars down to around 12th magnitude with my 8" Celestron CPC800 telescope. Nebulas disappear at about 10th magnitude. With high humidity the seeing is diminished by 2-4 magnitudes. On a rainy or snowy night I can literally read a book by the ambient light. The situation is causing me to give serious consideration to moving (yet again) to an area south of Erie that has darker skies. In a worst case scenario where mutations and cross-breeding causes trees, shrubs, bugs, and critters to collectively put off a large amount of light would not have the benefit of baffles to limit skyward-directed light. Telescopes in the middle of a desert or at the top of a mountain (above the timber line) might still be useful, but otherwise astronomers would be in real trouble.